Season 3 kicks of with a great social enterprise out of Chicago’s South Loop. 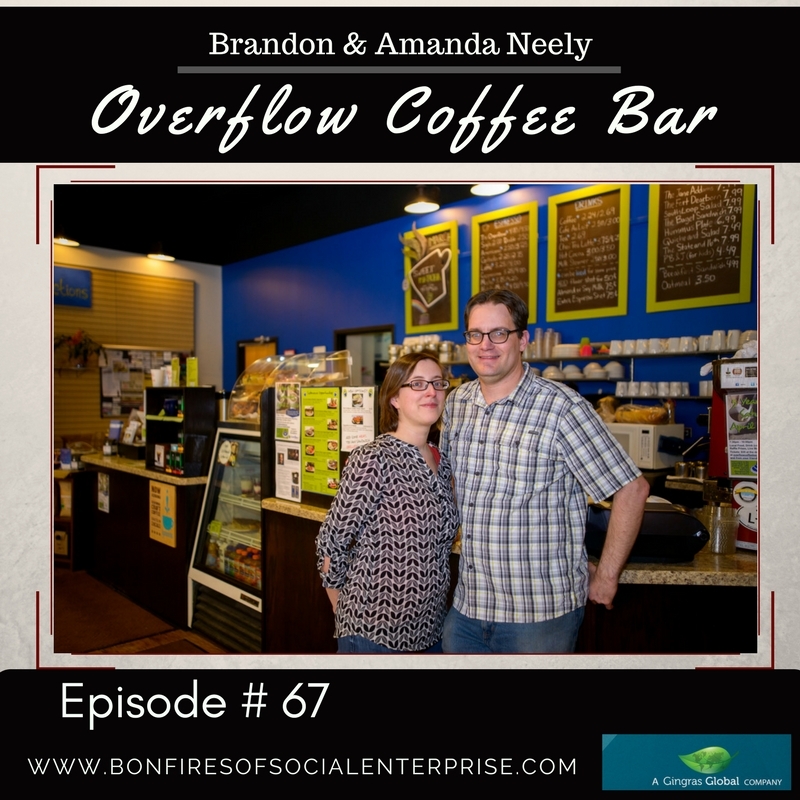 Get to know owners Amanda and Brandon Neely and listen how they overcame fears, built community, and decided that free is no good! As they sourced ethical coffee, they built a business and even took on a PRI! Romy: Welcome everyone to our official kick-off of Season three! This is Romy, and I want to thank you for hanging in there with us while we worked to prepare some episodes ahead of time. We have about 20 good episodes lined up for you this season. And today, we are starting off with a bang! Before we get rolling, let’s see what Jenzten has to share with us about some of the urban legends around the history of coffee in our episode’s Fun Fuel…. Romy: So welcome Amanda and Brandon to The Bonfires of Social Enterprise. Brandon: Hey thanks for having us. Romy: I'm excited to talk to you guys. We met maybe two or three years ago when I was in Chicago? Brandon: I think it was three years ago. Romy: Yeah. I've been following your progress. And you'd been open at that point I think about a year or a year and a half? Brandon: Yeah. We've been open about five and a half years now. Romy: Yeah. Well we should tell the listeners that you guys are married and running not just a coffee shop, Overflow Coffee, but we're going to hear today about a ton of cool things that you guys have in the works. So let's anchor everyone that doesn't know you right now about Overflow Coffee. So what is Overflow Coffee right now for Chicago? Brandon: So Overflow Coffee Bar is the third place, we call that the third place, where you would go as home, work, and then you go somewhere else, like your grandma's house or something. And we wanted to really create a third place in the south loop of Chicago, and that's where we came up with the idea of Overflow. Building community, and then also, the reason we started more of a social enterprise as ethical economics, coffee is the second most widely traded commodity in the world, and Americans, the number one consumer. And so as we were thinking about this years ago, we were like, we want to build community but we also want to change the world for the better, and what better way to do that then buying ethical coffee, so bridging community building and ethical economics and then we started the idea of Overflow Coffee Bar, and then in the place where we're at, there's a whole lot of space around us, which Amanda will share about, that we're housed in. So we're a part of a school that meets in the building, actually owns the building. And then there's a bunch of non-profits that are here as well. Romy: So you got some natural traffic there, and just for those that don't know, would you guys mind giving some definition to what ethical coffee means? Amanda: Okay, let me jump in on that one. So the way that coffee normally happens still has a lot of roots from imperialism and slavery. And a lot of the coffee farmers that grow what you might typically find in a grocery store are paid at very unfairly for the labor that they do. What we do with our ethically treated coffee, is we actually have more of a direct trade relationship with the farmers. And our roaster, his name's Tim Taylor, he goes directly to work with the coffee farmers, and then he arranges the export and the import of the coffee and then roasts it, and then we get it the next day. So we know the whole process of what happened with the coffee and everything. And we know for sure how much he paid those farmers. And typically it's at least 25% more then the fair trade rate, so it's even better then what you might know as fair trade certified coffee, and that money is going directly into the farmer's hands, rather then, all these different middle-men in between, and you're not really sure how much that farm made. So there's all of those checks and balances in the system, and we can know for sure who that farmer is, what they were paid, and that they're being able to provide for their family. Plus a lot of those same farmers use organic processes for growing their coffee too. They don't use pesticides, and [inaudible 00:04:32] like that. So we know that it's going to be good for the environment as well. Romy: And so you guys have built a community there. What are some of the things that you found using this coffee sourcing and the coffee bar, how do you feel that that's helped start to create this community? Brandon: Well first we started knowing our neighbors and then South Loop is a fairly new neighborhood. People tend to think, oh it's the South Loop, so therefore there's a lot of businesses, thriving businesses and all that. It was the fastest growing neighborhood in 2007, then the recession hit, and everything tanked. And so it's still recovering, so there's a lot of people moving here, but there's not a lot of businesses here. One of the things we learned as we were developing Overflow and learning, they always said, "Oh well you need to connect to Chambers of Commerce. You need to connect to those organizations that have been there for a long time." The challenge for us is there is no Chamber of Commerce for the South Loop because there was no South Loop actually a few years prior. And so we saw this as a challenge of how do we grow our business? How do we develop this? And so when you think about grassroots, doing something from the grassroots, we were like, well let's connect business leaders and all that stuff. And so over the course of time, accidentally started a Chamber of Commerce in the South Loop. We call it the South Loop Business Exchange, that we were helping to lead, start, and now actually, just last month set up a board, and we're able to successfully hand off the presidency to another business owner in the South Loop which was real, really encouraging. And seeing where a community was built and where we are seeing not just our friends coming and customers, but we're developing a relationship of commerce around the neighborhood. Romy: Well that's great. There's something special about even having a meeting place sometimes. Brandon: Yes. And seeing as I meet my customers, they have their passions and their dreams, and as they're working here, I'm able to connect them to other people who are in similar industries or similar passions, and that's been really cool to see over the past five years. Romy: I know you guys do some interesting things too. When I was there about three years ago, you guys were doing some fun things with sticky notes. You're probably way beyond that, but I've never forgotten that because I thought, "Gosh these guys give people that are in and around the all different kinds of ways to opt in and engage at the level that they want to do." And I just thought that, was such an interesting way to keep everyone connected. Brandon: Yeah, and the sticky note idea, that was, like Amanda's very thoughtful in her language, and so she would come up with a question, "How do you define poverty?" As one of our questions. And then people would respond with the sticky notes of their definition of poverty. And so that was really cool to see our customers interact on that scale. Romy: Because I feel that that makes you different and I feel like it keeps people in your place, especially when there isn't a street full of other businesses that they would, it's not a destination place other then, it might be convenience in the neighborhood but Amanda, what other things like that have worked well for you guys to keep your customers and well, I'd say beyond customers, these relationships engaged? Amanda: [inaudible 00:10:00] help build that community before it even had a physical space that we were going to be in. Doing some events too, and now we're actually taking a lot of what we learned and we started a new website overflowyourpossibility.com where we're reaching out to anybody who speaks english or can read english, or can use a google translator and sharing a lot of the things that we've learned that way and hoping that we can, as they engage with that content, we can also help those people engage with each other too. So now that we've got five years under our belt, we're starting to reach out further and figure out how do we take the things that we've learned and our message of ethical economics and community building and share that with like minded people all around the world. Romy: Well that's great, you're hitting on one of the things that always comes up. And you guys five years in, it's important to talk about the profit thing. Brandon and I dialogued a little bit about it before this interview and it's something that I've always said, when Social Enterprise became a thing and we named it that some years ago, one of the thoughts I always had and I always thought, gosh I kinda have a bent because I came out of financial planning but I'm always like, man one of the first things about sustainability is being able to keep your doors open. You can deliver all kinds of social impact but you got to have an opportunity to keep it going and so you got to have a positive cash flow and early on, I'd say, seven, eight years ago when this started to become hot topics conversation, when I'd say that people looked at me as if I had some sort of level of evil or something. [inaudible 00:11:58]. And I had to be like, well you know, I was just like, how are we going to keep this going long term? And now it's starting to be a good idea and I'm so thankful. Brandon: Well, I think that's a big thing. For us, we came into this, and as a younger entrepreneur's coming into this, we come in idealistic, and we have our business plan, and we're like, "Oh yeah it's going to be perfect for that business." And then life happens. And you, realize, like for us, we had Mariano's that came up right next door front to us, and we can't compete with them. But we have other things that we really built into our DNA, the people and planet, that really helped us to be able to take it to this level. But, we also the profit part, it was real, really, scary in that season because we weren't really thinking about that as much. And so having all three of those things did help us, but it really helped us to be more knowing our numbers, knowing how we can overcome things. That was one of those challenges that we had to face. Amanda: So I would actually add on to what Brandon is saying, that's how we felt when we just had our head down in our business, focused on things, we were so discouraged, how are we going to actually make this work, we had this idea that if it's not profitable, it's not sustainable, so we have to work really hard to make it profitable, and it totally [inaudible 00:13:48] get there [inaudible 00:13:49] we're not ready to let up on pushing the gas pedal. And then after our five year anniversary, we started looking around the social enterprises around us and talking to other people that knew where they were at in terms of profitability and sustainability, and we realized we actually have a ton to be proud of. We got a Program Related Investment after being open for a year, and that really helped us get all of the different loans that we had to take, consolidated the lower interest. And we've never missed a payment, paying that back, and we're almost, we're seven months from paying it back in full, and we found out that a lot of social enterprises, those Program Related Investments are supposed to be a low interest loan, but it turns into a grant, and they never get paid back. So for us to have paid it almost all the way back, and never missed a payment, we have a lot to be proud of. That means we're a lot more sustainable, or profitable then we thought we were when we look at comparable, other social enterprises around us. And just to make it five years is a big accomplishment as well. Romy: I'll say. Yeah, and well done on that, for the listeners who aren't familiar with PRI or Program Related Investment, typically that comes from foundations when they are, some foundations are willing to make an investment that's related to their social programming, or their missional programming at their foundation. And then if it doesn't work out, then they can turn it into a grant, just for those that are unfamiliar with it, and they're intended to be investments into for-profit social ventures. So yeah that's incredible, and the five-year mark, that's a real milestone. I don't think people realize what a milestone that is, specifically in a bigger city, where some of the costs are higher for rent, so there are all kinds of challenges in every place in the world but sometimes in the bigger US cities, the expenses are a bit higher, and it's a big deal. Well, congratulations, there's so many things, I'd love to ask you about, but I want to make sure that we get some of the questions I had in mind about you guys. You guys as thought leaders are moving way beyond, what did you say, Brandon, the barista's behind the bar, could we talk about some of this transitioning you're doing now? Brandon: Yeah so a lot of times people, this is how we work as individuals. We like to label people, and when we say, "Hey how's it going? And what do you do?" So as soon as we meet somebody, we find out they're a doctor and then we put them in a box, which is good in some aspects, but also it can be challenging especially when, I'm not just a barista, or the owner of a coffee shop, I'm a whole person and that's part of each entrepreneur that starts. And so we're stepping into being coaches and creating courses and things like that to help people in the social enterprise world because we might not be in the same industry but a lot of our challenges are the same, and maybe the lack of community or people who don't understand what it means to not being able to pay your bills or things like that. From a business side, we want to help foster and create more chances of success, then more chances of failure, and so that's where we're leading into helping, use what we've learned to mobilize other people to make a bigger impact. Whether it's in Chicago, I'd love to do it through the Chicago area, but all around the world. We're a interconnected world, how do we help each other succeed in that? Does that make sense? Romy: Yeah, so the format is going to be online coaching, or how? Brandon: Yeah, so we'll be doing some, I'd say we're going to work on creating a course soon, that will come out probably in January. And then the great thing in our time and place in the world right now, is the technology that we have, that we can connect with anybody via like you and I over headphones and a computer, we can build relationships through the technology and really be there with somebody and not sometimes be present. I do think there's an importance of being physically present, that's why we have a brick and mortar spot, that I think is super, super, key, but also when we are in our business we don't have time to necessarily go to a meeting that takes an hour plus travel time and all the other stuff and then you don't build that. So we want to help foster those kind of relationships through maybe masterminds, those kind of things. And leverage the resources and the relationships we've built over the past few years. Romy: Yeah, and so the goal would be to perhaps encourage others, what would be the overall goal and your target audience sounds like it would be other social enterprises? Amanda: Believe that if people were able to really figure out what their passion is and how to pursue that passion in a way that really gives them life, that they're actually doing to change the world and make it better for everybody that's here. For some people that'll look like starting a social enterprise, for other people that might look like volunteering for a nonprofit. For other people that might look like we're working for a big corporation, but being able to connect that in with their passion. That's really the journey that we went on, starting about ten years ago. We were trying to figure out, how do we take what we really, really love to do and what gives us life and creates, and do that as much as possible. That's what actually led us on this journey towards starting an Overflow Coffee Bar. That's still what's leading us forward in this journey toward helping inspire and teach others. That's what it really boils down to. Because we're social entrepreneurs, we think we might naturally attract people who are social entrepreneurs. It really it could be anybody who really, really can't imagine living their life without accomplishing what they're passionate about, and doing that with as much time as possible. Some people that might mean they get to change a couple of hours a week during this season of their life, but then they're able to really do full time after they "retire." For other people, it might mean that they go on a big journey like us and leave the comfort of a cubicle and start their own business. We don't want to say that nobody ... We want to say that everybody can do their passion. We really believe that doing that is actually what's going to make the world a better place. We want to be able to empower stay at home moms to do that, or stay at home dads. People who are "retired" from a regular job. College students and everybody in between. Romy: Wow. It sounds like there's going to potentially be some consulting in there as well. Amanda: The big thing about what we had ... I'm a millennial, I'll just put that out there. The big thing about us millennials is that we don't like to be told what to do. We like to be asked questions that help us figure it out on our own. With the right questions it's way better than just telling us what to do, and we get the same result. It's actually why we learned about coaching. We actually became certified as coaches. Coaching is all about asking the right questions. We don't want to necessarily just be consultants, because that's more like telling somebody what to do. We'd rather give people some resources, help ask the right questions, and really internalize and bring those passions out from within, and send them to new places where they can gain knowledge. Then ask the questions that help make that knowledge real in our lives and those kind of things. That's why we're talking about coaching instead of consulting. Romy: Oh I love it. That was a great synopsis. I love it. Empowering people. I see why you guys do well at your Overflow Coffee Bar. All right. You're shifting. I always think of this; I was telling Brandon this before we got started. It is true that sometimes social entrepreneurs can get labeled. There's always more going on. There's always more connecting, and ripple affects stuff going on in the communities. This case it's coffee is the center point for a season. It looks like you're going to move now, into more of a coaching and online presence; which is great. I'm a fan of the technology obviously. If we have it, let's not argue about it, let's use it for good. You know? I think this is a great next step because it's really in your wheelhouse. You've already been doing this everywhere you go. What are some of the big plans? What would you love to see when you let yourself dream big? Brandon: I would love to see, as we launch over [inaudible 00:24:27] possibility, that we're able to help empower tons and tons of people, and see cities transformed. Because of the hard work that we've put in. The five years and some of the sacrifices. That it wasn't maybe ... Sometime you feel, "Oh that's for nothing." Or there are challenges that we are able to help the younger entrepreneurs that listen to this or people who want to affect, change the world through their passions, that they don't have to go through some of the same challenges we did. They will have challenges, they're just going to be different challenges. That's something that I'm really excited about. I would love to see, in the future that we have multiple overflows. That is not off the table for sure. We're taking one step at a time. There's a whole lot we would love to do. We just want to be listening to our hearts, our relationships, the people around us. Then taking that next step. As we see the next step and as we move through that forest we can see a little bit further. Where that takes us, I've got no idea, but I'm ready for the journey. Romy: As you guys know and I know, whether you're a social business or a regular business, or you're attempting any of the above, there's always some part and some point along the timeline or multiple points along the timeline that you run into something that you've got to address within yourself. It's usually some sort of fear coming out that needs to go. It shouldn't be there anyway. It really helps to have community in times like that. Just as simple sometimes as a, "You can do it." Because that person that in effect, we all have to do it ourselves. We all have to take those steps of courage sometimes when we don't feel brave. Sometimes just knowing that there's other folks that are there encouraging you. Or you've got a place to go, [inaudible 00:26:47] feel it a little bit. It helps. Brandon: Yeah. I think for us ... One example for me is public speaking. I was just talking to Amanda about this yesterday, that I hated public speaking. I was, I guess, not very good at it. Over the course of doing this for a few years, you know your elevator pitch. You say it a bunch. Now, we've done speeches in front of people and maybe even talks at our church and things like that, where it's become easier. I had to start somewhere. Had to learn the craft and get better at it. Not that I'm ever going to be there, but it's at least a step in embracing your fears. Romy: Yeah. How about for you Amanda? Is there something that you've had to tackle? Amanda: Well, there's so many things. I'm trying to pick which one. Probably the biggest thing for me is that I'm a perfectionist. Sometimes perfectionism can really hold me back from pushing the publish button, or being ready to move forward with a new product, or a bunch of different things. I really had to be okay with putting together something that's really rough and pretty horrible to start with, and then being willing to share that with people. Rather than just keep it to myself until it's perfect. Turns out that we usually end up with something even better. When we've involved more people in it and I was willing to share it even before it was good. When it was still really bad. Romy: Yeah. That's such a good word. Boy that's a word of encouragement for everyone there, because you'll never really get it to the place where you're in love with it. Our products and our services and our output, if you will, I find reaches a place of maturity where it feels good to most people. Then you can grow something else. It reminds me of gardening in some ways. Brandon: Yelp review, and so I had talked to him and said, "I saw your Yelp review, I hope we're getting better and here are some of the things I want to do." And I had shared, "it's me and my wife, we're here all the time, we want to be open for the long haul and so we can't be open until 11 and night every night because that will kill us." And he had told me that he was a business major, and I had shared with him and said, "well so, then you know as a business major you start with little hours and then you expand, you don't start with everything and then ... take away." And so we've seen our growth expand over time and even the décor in the coffee shop to our knowledge ... But we start with what we know and you'll get the Yelp reviewers who are going to tell you, "you're not doing this you're not doing that," but I know where I want to go and we do what we can and then we take it a little step further. But also sharing with them ... "Actually I do know that, and I'm working on it," and so that's ... your dialogue with your customers or audience is really important. Amanda: Yeah, and I find people like to be part of the journey. They like to know what's happening, they like to see when you make an improvement, because they somehow feel like they've become your family when they're with you from the beginning. You know? Brandon: That's what's fun is we have so much family around here. When we had our five year party in April that was a transition for us when people were like, "you are experts, you are thought leaders in this." And we're like, "oh really? We are?" We had a 100 of our closest friends and family meeting our customers ... in the space where we were sharing our five year celebration and ... just the excitements in the room, the Chamber of Commerce had just launched and it was just super encouraging and just ... to look around that room was powerful. And then saying, "oh well, look at this," and then having more confidence in yourself. Like, a lot of times when you start your own thing you don't have as much confidence or you feel like you don't know a lot. But over time, owning those little things that come easy to you to help others. Amanda: And I think over time, I don't know if you find this, eventually you realize everybody else doesn't really have it figured out either. Like everyone's doing the same thing, it's just ... you know? Brandon: They say fake it til' you make it and half the time like as a ... owner of this business I'm just like, "I ... I don't know." You know? You know, we'll figure it out. My staff will call me for challenges or problems and I'm like ... "what am I going to about?" Romy: Yeah no idea, you're right. Well, I'm glad we talked about the whole fear thing, it's so funny because it happens all the time I got to admit many of our listeners know that was me with this podcast. I mean, I was terrified. Sometimes I'm still terrified to do it, but I just keep doing it and now I'm ... I wouldn't say I'm not ... all the way comfortable, but I'm more comfortable than I was. So, bring it on. It's gone. Brandon: And you just do it, and you know, over time you're like, "oh well, nothing zapped me." Romy: Right. I'm still alive, right. All right, well really good, well this great stuff you guys. You guys have done a tremendous job with that coffee bar there, and you've inspired so many. I have a feeling you've inspired far more folks than even show up to your celebrations, especially building networks. All of those things, in my opinion, lay the foundations for bigger platforms and more scale. I love that you're doing things differently, I love it that you're thoughtful about it. And you guys are incredibly talented you guys ... Even though you're careful about it you really are probably putting the work of seven out, because you're thoughtful ... with just two of you. Brandon: I would say that's definitely Amanda, she's the more of the thoughtful leader. For sure. Brandon: I'm an eight on the Enneagram. She has to pull me back a lot if you know anything about the Enneagram. Brandon: It's a great personality test that's in our thing that we're releasing ... part of our course. But, the Enneagram ... I end up getting myself in a lot of trouble because of my personality. Brandon: She's the reserved one, and more of the thoughtful one and I'm like, "oh I shouldn't have said that." Romy: Okay. End up agreeing to a few too many things sometimes? Brandon: Yeah sometimes, or just putting my foot in my mouth. Things like that. Brandon: I'm a big proponent of justice and ... sometimes that is not a very political thing. Brandon: You know ... anyway. Romy: Right, right. Okay. Well before we give everyone a chance of where to reach you on your social media and that ... Would you guys mind talking about some of the things you've been posting about ... "it's not free," or "free zone." We'll leave our listeners with maybe one tip from you guys that you're already putting out on social media about, "it's not free," or "it doesn't need to be free," something like that. Brandon: "Nothing in life is free." I actually wrote that one. The idea for what I've been thinking about is, we live in a culture of getting it free and cheap. Everything as free and as cheap as possible. I call it ... it's somewhat The Walmart Effect. Where we want it as little of an expense to us as possible. And this "nothing in life is free" idea is that over time with the Walmart Effect we've gotten rid of our general stores, we've gotten rid of our local economy and we've in the process given our jobs to other countries ... so that way the businesses can compete with that. And we wonder what happened to us and why are we in this state that we're in. My big thought is, what we water, grows. If we want local economy to succeed, we need to water the local economy. We need to water the businesses that are in place there, not asking "can I get it cheaper," "can I get it as the lowest cost to me," because in the end it's going to cost us way more than we think. So for us, and stepping into this ... thing through the coffee shop, it's been more of really ... watering this idea of local economy, of supporting other businesses, realizing that it may cost us on the short end but on the long end it's going to be so many better rewards. And so that's what I've been thinking about a lot of ... free is not good for us. The next time you go and you get that free sample or you get a really cheap cup of coffee or cheap thing, just think about, "who paid for this? Was it me? Did the consumer or did the store pay for it? Was it the producer?" Someone paid for it. So really ... how do we have a fair system all the way across? Does that make sense? Romy: Yeah ... yeah. Amanda, do you have anything you'd want to add to that? Brandon: I think Brandon did a good job up on his soapbox. You saw a little bit of what he was saying about the Enneagram and being an eight ... with that little rant there. But, it just shows when you're passionate about something it's okay to go on some rants sometimes, and those rants actually help build, community and get to know people better. I think everyone will either love what Brandon just said, or hate what Brandon just said, and that can be a great thing. To really be passionate about something and not be just holding the status quo all the time ... in the middle. I'm a little more afraid sometimes to say what I think, and Brandon helps push me in that kind of way too, to make sure that I'm sharing my opinions. I still use a spoonful of sugar sometimes when I ... most of the time when I share my opinions, and I think that's a good way to, go about it too. But, I do go on my rants sometimes about the things that I really believe in. Romy: Well, good. I think sometimes part of the problem is people don't speak up. Sometimes, even though it appears ... right now in the news a lot of people are speaking maybe a little too loudly on some subjects but ... I find more often than that it's ... people want to have a way to say something and don't know how, or don't voice what needs to be said. There's always a running truth for everybody and someone else's truth might not match another person's, but it doesn't mean it's not their truth. Fortunately, we live in a country where we're able to speak our truth. Amanda: The big thing I would say is that, listening is the other side of that. To have a conversation you have to have both sides and Brandon's actually a really good listener as well, and I think I am too. And I think that's why we've been so successful at building community is because we're willing to share what we really think, but we're also willing to really listen and understand where they're coming from too. And I think Brandon is going to say something else. Brandon: I was also thinking about ... one of the taglines we've been using a lot lately, and we even made bags through it, it's "#SmallMatters." The idea is that the small things you do matter. And we can be on our soapbox, and we can talk all day, long, but it's the really small things we do over time whether it's ... developing relationships with our family, to how we spend our money, to where we spend our time. The small things we do matter. We saw this I would say in the election when we thought,"it's not going to matter with small town America, or the rural places." But, we saw, small matters. Those things matter, both positive and negative, wherever you land on it. We have to look at those things that we do and that every day, moments matter, and how we spend our money, and we spend our time, in the little steps toward our passion ... those things matter. And start listening to other people in that process. Romy: That's a good word. That's a good word for us to close on right there. Keep listening everyone. How would anyone reach you guys? Maybe give us for your Overflow Coffee Bar, but also your new coaching business. Amanda: So we're at OverflowYourPossibility.com, you could also ... we're big fans of social media, especially Twitter, you can find Brandon at @OverflowBrandon and you can tweet me at @OverflowAmanda. We'll tweet you back, we'll follow you back, we'd love to start a dialogue there on Twitter and you could also subscribe to our blog on the OverflowYourPossibility.com site. Brandon: And then we have the coffee shop at @OverflowCoffeeBar, you can find that on Facebook and Twitter as well. We're at 16th and States in Chicago, so if you're ever on vacation here ... I know a lot of people from Detroit come this way as well, so ... come on by, look for us, we're here almost all the time. Trying to leave a little more to work on Overflow Your Possibility at home so we can actually focus on it, but if you come in the morning you'll find, us for sure. Romy: That's great you guys. Well thanks again for being on the Bonfires of Social Enterprise and we'll catch back up with you guys. Brandon: Awesome, thanks for having us. Amanda: Thanks for having us.